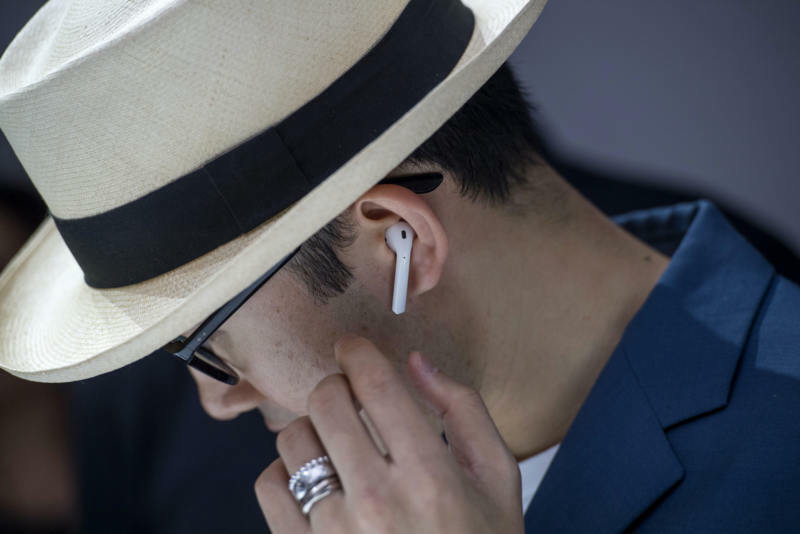 Американская компания «Apple» готовит к выпуску улучшенные наушники «AirPods 2». Мобильный аксессуар пополнится рядом новых функций, а также усовершенствованным аппаратным и программным обеспечением. Apple Inc. Беспроводные наушники AirPod. IT-гигант «Apple» поразил пользователей революционными беспроводными наушниками «AirPods» в прошлом году. Однако специалисты компании решили не останавливаться на достигнутом и усовершенствовать имеющийся аксессуар. Уже в октябре 2018 года «Apple» планирует выпустить обновленную версию известного гаджета «AirPods 2». Разработчики усовершенствуют и добавят несколько функций новым наушникам. Наушники «AirPods 2» обещают сделать водонепроницаемыми: они будут устойчивыми к капель воды и дождя. Однако погружать в воду устройство разработчики не советуют. В отличие от последних моделей «Iphone», которые можно опускать в воду полностью, защитной функции «AirPods 2» не хватит для полноценной протекции внутреннего наполнения. Также мобильный гаджет получит поддержку голосового помощника «Hey, Siri». Теперь владелец «Iphone» будет иметь возможность связываться с виртуальным ассистентом через наушники. Будет работать новая функция с помощью «Bluetooth» и чипов «W1» и «W2», «Apple» выпустила еще в прошлом году. I simply want to say I’m newbie to weblog and truly loved you’re website. More than likely I’m likely to bookmark your blog . You certainly come with wonderful articles. With thanks for sharing your blog site. Thanks for any other informative site. Where else could I get that kind of information written in such a perfect manner? I have a mission that I’m simply now operating on, and I have been on the glance out for such information. I enjoy you because of all your valuable work on this web page. My niece really loves working on investigations and it’s obvious why. A number of us notice all regarding the lively method you give great suggestions through the web blog and in addition attract contribution from others about this content then my girl is truly being taught a whole lot. Take pleasure in the rest of the new year. Your performing a tremendous job. Hi there. I discovered your blog by the use of Google even as searching for a comparable subject, your website came up. It appears good. I have bookmarked it in my google bookmarks to visit then. Hi there. I found your blog via Google whilst looking for a comparable matter, your website got here up. It appears good. I’ve bookmarked it in my google bookmarks to visit then. Hi there. I discovered your blog via Google at the same time as looking for a comparable matter, your website got here up. It appears great. I have bookmarked it in my google bookmarks to visit then. Hi there. I found your web site by means of Google while looking for a comparable topic, your web site got here up. It seems good. I have bookmarked it in my google bookmarks to come back then. Hiya, I’m really glad I’ve found this information. Today bloggers publish just about gossip and internet stuff and this is actually annoying. A good web site with interesting content, that is what I need. Thanks for making this web-site, and I’ll be visiting again. Do you do newsletters by email? Hiya, I am really glad I have found this information. Today bloggers publish only about gossip and net stuff and this is really annoying. A good web site with interesting content, this is what I need. Thank you for making this site, and I will be visiting again. Do you do newsletters by email? Hiya, I am really glad I have found this info. Today bloggers publish just about gossip and internet stuff and this is really irritating. A good site with exciting content, that is what I need. Thank you for making this website, and I’ll be visiting again. Do you do newsletters by email? Hi there. I found your web site by way of Google whilst searching for a similar topic, your site got here up. It seems great. I’ve bookmarked it in my google bookmarks to come back then. Hiya, I am really glad I’ve found this info. Nowadays bloggers publish just about gossip and internet stuff and this is really annoying. A good blog with interesting content, that is what I need. Thanks for making this web-site, and I’ll be visiting again. Do you do newsletters by email? Hello there. I discovered your blog by way of Google while looking for a related matter, your website got here up. It seems to be great. I have bookmarked it in my google bookmarks to visit then. Hey there. I discovered your blog by way of Google at the same time as looking for a similar topic, your website came up. It appears good. I’ve bookmarked it in my google bookmarks to visit then. Hey there. I discovered your website by means of Google whilst searching for a comparable matter, your web site came up. It seems great. I have bookmarked it in my google bookmarks to come back then. Hi there. I discovered your website by the use of Google even as searching for a comparable matter, your website came up. It looks good. I’ve bookmarked it in my google bookmarks to visit then. Hi there. I discovered your site via Google at the same time as searching for a related subject, your website got here up. It looks great. I have bookmarked it in my google bookmarks to come back then. Hi there. I discovered your site by way of Google whilst searching for a similar topic, your site got here up. It appears great. I’ve bookmarked it in my google bookmarks to come back then. Hi there. I found your website by way of Google while looking for a comparable topic, your site got here up. It appears to be great. I’ve bookmarked it in my google bookmarks to visit then. Hey there. I discovered your blog via Google at the same time as looking for a comparable subject, your web site got here up. It seems good. I have bookmarked it in my google bookmarks to come back then. Hey there. I discovered your blog by means of Google at the same time as looking for a similar subject, your web site got here up. It looks great. I have bookmarked it in my google bookmarks to visit then. Hey there. I discovered your blog by means of Google while searching for a comparable topic, your website got here up. It seems to be good. I have bookmarked it in my google bookmarks to come back then. Hiya, I’m really glad I’ve found this info. Nowadays bloggers publish just about gossip and net stuff and this is actually frustrating. A good web site with interesting content, this is what I need. Thanks for making this website, and I’ll be visiting again. Do you do newsletters by email? Hey there. I found your web site by means of Google whilst looking for a related subject, your web site got here up. It appears to be great. I’ve bookmarked it in my google bookmarks to visit then. Hi there. I discovered your blog by the use of Google whilst looking for a similar matter, your website came up. It seems to be good. I have bookmarked it in my google bookmarks to visit then. Hiya, I’m really glad I have found this info. Today bloggers publish only about gossip and web stuff and this is actually frustrating. A good blog with exciting content, this is what I need. Thanks for making this web-site, and I’ll be visiting again. Do you do newsletters by email? Hiya, I am really glad I’ve found this info. Today bloggers publish only about gossip and web stuff and this is really irritating. A good site with interesting content, that is what I need. Thank you for making this website, and I will be visiting again. Do you do newsletters by email? Hiya, I am really glad I have found this information. Nowadays bloggers publish just about gossip and internet stuff and this is actually frustrating. A good web site with interesting content, that’s what I need. Thank you for making this web site, and I will be visiting again. Do you do newsletters by email? Hi there. I found your web site by the use of Google while looking for a similar topic, your website got here up. It seems to be good. I’ve bookmarked it in my google bookmarks to come back then. I want to express my affection for your generosity giving support to men and women that should have assistance with in this theme. Your real commitment to getting the message along has been unbelievably insightful and has continuously helped some individuals just like me to achieve their desired goals. Your amazing warm and friendly useful information signifies a lot a person like me and especially to my fellow workers. Thanks a ton; from all of us. Hey there. I found your site by the use of Google whilst searching for a related subject, your site got here up. It seems great. I’ve bookmarked it in my google bookmarks to visit then. Hiya, I’m really glad I have found this info. Nowadays bloggers publish just about gossip and web stuff and this is really annoying. A good blog with interesting content, this is what I need. Thanks for making this site, and I’ll be visiting again. Do you do newsletters by email? Hiya, I’m really glad I have found this information. Today bloggers publish just about gossip and internet stuff and this is really annoying. A good site with exciting content, that is what I need. Thanks for making this web site, and I will be visiting again. Do you do newsletters by email? Hi there. I found your web site via Google while looking for a comparable matter, your web site got here up. It appears to be good. I have bookmarked it in my google bookmarks to visit then. Hey there. I found your web site by means of Google even as looking for a similar subject, your website got here up. It appears to be good. I’ve bookmarked it in my google bookmarks to come back then. Hi there. I discovered your site by the use of Google even as looking for a similar subject, your web site got here up. It appears great. I have bookmarked it in my google bookmarks to come back then. Hi there. I discovered your web site by means of Google at the same time as looking for a related matter, your web site got here up. It seems good. I have bookmarked it in my google bookmarks to visit then. Hiya, I’m really glad I have found this information. Nowadays bloggers publish only about gossip and web stuff and this is actually frustrating. A good web site with exciting content, this is what I need. Thanks for making this web site, and I’ll be visiting again. Do you do newsletters by email? Hiya, I am really glad I have found this information. Today bloggers publish only about gossip and internet stuff and this is actually irritating. A good blog with interesting content, that is what I need. Thank you for making this site, and I will be visiting again. Do you do newsletters by email? Hiya, I am really glad I have found this info. Nowadays bloggers publish just about gossip and net stuff and this is really irritating. A good web site with exciting content, that is what I need. Thank you for making this web-site, and I will be visiting again. Do you do newsletters by email? Hiya, I am really glad I’ve found this info. Nowadays bloggers publish just about gossip and internet stuff and this is really frustrating. A good website with interesting content, that is what I need. Thank you for making this website, and I’ll be visiting again. Do you do newsletters by email? Hi there. I discovered your website via Google while searching for a related topic, your web site came up. It appears to be great. I have bookmarked it in my google bookmarks to come back then. Hi there. I discovered your website via Google even as searching for a related topic, your website got here up. It appears good. I’ve bookmarked it in my google bookmarks to come back then. Hi there. I found your blog by way of Google at the same time as looking for a related topic, your site got here up. It seems to be great. I have bookmarked it in my google bookmarks to come back then. Hey there. I discovered your website by way of Google while looking for a similar subject, your site got here up. It seems great. I have bookmarked it in my google bookmarks to come back then. Hello there. I found your web site by means of Google whilst looking for a similar topic, your site came up. It appears to be good. I have bookmarked it in my google bookmarks to visit then. Hiya, I am really glad I have found this info. Nowadays bloggers publish just about gossip and web stuff and this is actually irritating. A good website with exciting content, this is what I need. Thank you for making this web-site, and I will be visiting again. Do you do newsletters by email? Hiya, I am really glad I’ve found this information. Nowadays bloggers publish only about gossip and net stuff and this is really frustrating. A good blog with exciting content, that’s what I need. Thank you for making this site, and I will be visiting again. Do you do newsletters by email? Hey there. I discovered your website by means of Google whilst searching for a similar topic, your web site got here up. It appears good. I’ve bookmarked it in my google bookmarks to come back then. I just want to mention I am beginner to blogging and site-building and really savored your web site. Likely I’m planning to bookmark your website . You definitely come with superb stories. Appreciate it for sharing with us your web page. Hiya, I am really glad I’ve found this info. Today bloggers publish only about gossip and net stuff and this is actually irritating. A good blog with exciting content, this is what I need. Thanks for making this web site, and I’ll be visiting again. Do you do newsletters by email? Hey there. I found your site by the use of Google at the same time as searching for a similar topic, your web site got here up. It appears to be good. I’ve bookmarked it in my google bookmarks to visit then. Hiya, I am really glad I have found this info. Nowadays bloggers publish just about gossip and internet stuff and this is really irritating. A good blog with interesting content, that is what I need. Thanks for making this web-site, and I will be visiting again. Do you do newsletters by email? Hiya, I’m really glad I’ve found this info. Today bloggers publish only about gossip and net stuff and this is really irritating. A good website with exciting content, this is what I need. Thank you for making this site, and I’ll be visiting again. Do you do newsletters by email? Hey there. I found your site by the use of Google even as looking for a similar subject, your website got here up. It seems great. I’ve bookmarked it in my google bookmarks to visit then. Hiya, I’m really glad I have found this information. Nowadays bloggers publish only about gossip and internet stuff and this is really frustrating. A good site with exciting content, that’s what I need. Thank you for making this website, and I will be visiting again. Do you do newsletters by email? Hi there. I found your site by means of Google whilst looking for a related subject, your site got here up. It appears great. I have bookmarked it in my google bookmarks to visit then. Hey there. I found your website by means of Google at the same time as searching for a similar topic, your web site came up. It appears to be great. I’ve bookmarked it in my google bookmarks to visit then. Hi there. I found your web site by means of Google while looking for a related subject, your web site got here up. It appears good. I have bookmarked it in my google bookmarks to come back then. Hiya, I am really glad I have found this information. Today bloggers publish just about gossip and internet stuff and this is actually annoying. A good website with exciting content, that’s what I need. Thank you for making this web-site, and I will be visiting again. Do you do newsletters by email? Hello there. I discovered your website by means of Google while searching for a related topic, your web site got here up. It seems good. I’ve bookmarked it in my google bookmarks to visit then. Hi there. I discovered your web site by means of Google even as searching for a similar matter, your website came up. It seems great. I have bookmarked it in my google bookmarks to come back then. Hiya, I am really glad I have found this info. Nowadays bloggers publish only about gossip and internet stuff and this is really frustrating. A good web site with exciting content, that is what I need. Thank you for making this web site, and I’ll be visiting again. Do you do newsletters by email? Hiya, I am really glad I’ve found this information. Today bloggers publish only about gossip and net stuff and this is actually annoying. A good site with interesting content, this is what I need. Thanks for making this web-site, and I’ll be visiting again. Do you do newsletters by email? Hello there. I discovered your site by means of Google while looking for a similar topic, your website got here up. It seems good. I’ve bookmarked it in my google bookmarks to visit then. Hiya, I’m really glad I’ve found this information. Today bloggers publish only about gossip and web stuff and this is really annoying. A good blog with exciting content, that is what I need. Thank you for making this web-site, and I will be visiting again. Do you do newsletters by email? Hey there. I discovered your blog via Google at the same time as looking for a similar topic, your site came up. It seems great. I have bookmarked it in my google bookmarks to visit then. Hello there. I discovered your website by the use of Google at the same time as searching for a related subject, your site came up. It appears good. I’ve bookmarked it in my google bookmarks to come back then. whoah this blog is magnificent i love studying your posts. Stay up the great work! You know, a lot of people are searching around for this information, you can help them greatly. Hiya, I am really glad I have found this information. Nowadays bloggers publish only about gossip and internet stuff and this is really irritating. A good website with interesting content, this is what I need. Thank you for making this site, and I will be visiting again. Do you do newsletters by email? Hiya, I’m really glad I’ve found this info. Nowadays bloggers publish just about gossips and web and this is actually irritating. A good blog with exciting content, that is what I need. Thanks for keeping this web site, I will be visiting it. Do you do newsletters? Can not find it. Hi there. I found your website via Google whilst searching for a related subject, your website got here up. It appears to be good. I have bookmarked it in my google bookmarks to come back then. Hiya, I’m really glad I’ve found this info. Nowadays bloggers publish only about gossip and web stuff and this is really annoying. A good site with exciting content, that’s what I need. Thank you for making this web site, and I will be visiting again. Do you do newsletters by email? Hiya, I am really glad I’ve found this information. Nowadays bloggers publish only about gossip and net stuff and this is really irritating. A good blog with interesting content, that is what I need. Thank you for making this site, and I’ll be visiting again. Do you do newsletters by email? Hello there. I discovered your website by means of Google whilst looking for a related matter, your web site got here up. It appears to be great. I’ve bookmarked it in my google bookmarks to come back then. Hello there. I discovered your blog via Google at the same time as searching for a comparable topic, your website got here up. It appears to be good. I have bookmarked it in my google bookmarks to visit then. Hi there. I found your site via Google at the same time as searching for a related subject, your website got here up. It appears great. I have bookmarked it in my google bookmarks to come back then. Hiya, I’m really glad I’ve found this information. Nowadays bloggers publish only about gossip and net stuff and this is actually irritating. A good web site with interesting content, this is what I need. Thank you for making this web site, and I will be visiting again. Do you do newsletters by email? Hiya, I am really glad I’ve found this information. Today bloggers publish only about gossip and web stuff and this is actually annoying. A good site with interesting content, this is what I need. Thanks for making this site, and I will be visiting again. Do you do newsletters by email? Hiya, I’m really glad I’ve found this information. Nowadays bloggers publish only about gossip and internet stuff and this is really frustrating. A good site with exciting content, this is what I need. Thanks for making this website, and I will be visiting again. Do you do newsletters by email? Hiya, I’m really glad I have found this info. Today bloggers publish just about gossip and internet stuff and this is really irritating. A good web site with interesting content, that is what I need. Thank you for making this website, and I’ll be visiting again. Do you do newsletters by email? Hiya, I’m really glad I’ve found this info. Today bloggers publish just about gossip and web stuff and this is actually frustrating. A good website with interesting content, that’s what I need. Thank you for making this web-site, and I will be visiting again. Do you do newsletters by email? Hi there. I discovered your site by way of Google whilst looking for a related subject, your website came up. It looks great. I have bookmarked it in my google bookmarks to come back then. Hey there. I discovered your website by means of Google while looking for a similar matter, your site came up. It appears good. I have bookmarked it in my google bookmarks to visit then. Hi there. I discovered your website by means of Google even as searching for a similar matter, your website got here up. It appears great. I’ve bookmarked it in my google bookmarks to come back then. Hello there. I discovered your web site by the use of Google whilst searching for a comparable topic, your site got here up. It seems to be good. I have bookmarked it in my google bookmarks to visit then. Hiya, I’m really glad I’ve found this information. Today bloggers publish just about gossip and web stuff and this is actually irritating. A good web site with exciting content, this is what I need. Thanks for making this site, and I’ll be visiting again. Do you do newsletters by email? Hiya, I am really glad I have found this information. Today bloggers publish only about gossip and internet stuff and this is really annoying. A good blog with exciting content, this is what I need. Thanks for making this website, and I will be visiting again. Do you do newsletters by email? Hiya, I am really glad I’ve found this info. Today bloggers publish just about gossip and internet stuff and this is really frustrating. A good site with exciting content, that is what I need. Thanks for making this web site, and I will be visiting again. Do you do newsletters by email? Hi there. I discovered your blog via Google while looking for a related subject, your website got here up. It looks great. I have bookmarked it in my google bookmarks to visit then. Hello there. I found your blog by the use of Google whilst searching for a related subject, your website came up. It appears great. I have bookmarked it in my google bookmarks to visit then. Hello there. I found your blog by way of Google even as looking for a similar subject, your web site got here up. It seems good. I’ve bookmarked it in my google bookmarks to come back then. Hey there. I found your site by means of Google while searching for a related subject, your web site got here up. It looks great. I have bookmarked it in my google bookmarks to visit then. Hiya, I am really glad I have found this information. Today bloggers publish only about gossip and net stuff and this is really annoying. A good blog with exciting content, that’s what I need. Thanks for making this website, and I will be visiting again. Do you do newsletters by email? Hello there. I discovered your site by means of Google at the same time as looking for a related topic, your site came up. It looks good. I’ve bookmarked it in my google bookmarks to visit then. Hiya, I am really glad I’ve found this information. Nowadays bloggers publish just about gossip and internet stuff and this is really frustrating. A good blog with exciting content, that’s what I need. Thank you for making this site, and I will be visiting again. Do you do newsletters by email? Hey there. I discovered your web site by the use of Google while looking for a similar subject, your site got here up. It appears great. I’ve bookmarked it in my google bookmarks to visit then. Hello there. I found your website by the use of Google even as looking for a comparable subject, your site got here up. It seems good. I’ve bookmarked it in my google bookmarks to come back then. Hey there. I discovered your site via Google while searching for a related matter, your website got here up. It seems to be good. I’ve bookmarked it in my google bookmarks to come back then. Hello there. I found your web site by the use of Google even as searching for a related subject, your site got here up. It seems great. I have bookmarked it in my google bookmarks to come back then. Hello there. I found your site by way of Google whilst searching for a related topic, your site came up. It appears to be good. I have bookmarked it in my google bookmarks to come back then. Hiya, I’m really glad I’ve found this information. Today bloggers publish just about gossip and web stuff and this is actually frustrating. A good blog with exciting content, this is what I need. Thanks for making this site, and I’ll be visiting again. Do you do newsletters by email? Hello there. I discovered your website by way of Google whilst looking for a comparable matter, your web site got here up. It seems good. I’ve bookmarked it in my google bookmarks to come back then. Hi there. I discovered your blog by way of Google whilst searching for a related subject, your website got here up. It appears to be great. I’ve bookmarked it in my google bookmarks to come back then. Hello there. I discovered your blog by means of Google while looking for a related subject, your website got here up. It seems great. I have bookmarked it in my google bookmarks to visit then. Hiya, I’m really glad I’ve found this information. Today bloggers publish just about gossip and internet stuff and this is really annoying. A good blog with interesting content, this is what I need. Thanks for making this web-site, and I’ll be visiting again. Do you do newsletters by email? Hi there. I discovered your web site by the use of Google even as looking for a similar topic, your site got here up. It looks good. I have bookmarked it in my google bookmarks to come back then. Hiya, I am really glad I’ve found this information. Nowadays bloggers publish only about gossip and internet stuff and this is actually annoying. A good site with exciting content, that is what I need. Thanks for making this site, and I’ll be visiting again. Do you do newsletters by email? Hiya, I’m really glad I’ve found this information. Nowadays bloggers publish just about gossip and internet stuff and this is actually frustrating. A good site with interesting content, that is what I need. Thank you for making this web site, and I will be visiting again. Do you do newsletters by email? Hiya, I am really glad I have found this information. Today bloggers publish only about gossip and net stuff and this is actually frustrating. A good web site with exciting content, that is what I need. Thanks for making this website, and I will be visiting again. Do you do newsletters by email? Hiya, I am really glad I’ve found this info. Today bloggers publish just about gossip and web stuff and this is actually frustrating. A good website with exciting content, this is what I need. Thanks for making this site, and I will be visiting again. Do you do newsletters by email? Hey there. I found your blog by way of Google while looking for a similar subject, your site came up. It seems to be good. I’ve bookmarked it in my google bookmarks to visit then. Hiya, I’m really glad I have found this info. Today bloggers publish only about gossip and internet stuff and this is really frustrating. A good website with interesting content, this is what I need. Thanks for making this web site, and I will be visiting again. Do you do newsletters by email? Hiya, I’m really glad I have found this information. Today bloggers publish just about gossip and internet stuff and this is really annoying. A good blog with exciting content, this is what I need. Thanks for making this web site, and I will be visiting again. Do you do newsletters by email? Simply obtained a Blogger account, it functions great, but exactly how do I discover different customers blogs I such as with search. I keep in mind there is a means, however I am not seeing it now. Many thanks for your assistance. Hey there. I discovered your site by way of Google at the same time as searching for a related topic, your web site got here up. It seems good. I’ve bookmarked it in my google bookmarks to visit then. Hiya, I’m really glad I have found this info. Today bloggers publish only about gossip and net stuff and this is actually irritating. A good website with exciting content, this is what I need. Thank you for making this web-site, and I’ll be visiting again. Do you do newsletters by email? I am transforming holding firms and also wish to relocate my WordPress Blogs over. Does any person understand of an easy means to complete this?. Hey there. I found your website by the use of Google at the same time as looking for a similar subject, your web site got here up. It seems good. I’ve bookmarked it in my google bookmarks to visit then. Hiya, I am really glad I’ve found this information. Nowadays bloggers publish only about gossip and internet stuff and this is really annoying. A good blog with interesting content, this is what I need. Thank you for making this web-site, and I will be visiting again. Do you do newsletters by email? Hi there. I discovered your blog by way of Google even as searching for a related subject, your site got here up. It seems to be good. I’ve bookmarked it in my google bookmarks to come back then. Hiya, I’m really glad I’ve found this info. Today bloggers publish just about gossip and web stuff and this is really frustrating. A good blog with exciting content, this is what I need. Thanks for making this web site, and I’ll be visiting again. Do you do newsletters by email? Hey there. I discovered your web site by the use of Google even as searching for a similar topic, your web site came up. It seems to be great. I have bookmarked it in my google bookmarks to visit then. Hiya, I’m really glad I’ve found this information. Today bloggers publish only about gossip and net stuff and this is actually frustrating. A good website with exciting content, that’s what I need. Thank you for making this web site, and I’ll be visiting again. Do you do newsletters by email? Hello there. I found your web site via Google at the same time as looking for a similar matter, your website got here up. It appears great. I’ve bookmarked it in my google bookmarks to visit then. Hey there. I found your website by the use of Google while searching for a comparable subject, your website got here up. It seems to be great. I’ve bookmarked it in my google bookmarks to come back then. Hiya, I’m really glad I have found this information. Nowadays bloggers publish just about gossip and internet stuff and this is really frustrating. A good site with interesting content, that’s what I need. Thanks for making this site, and I will be visiting again. Do you do newsletters by email? Hello there. I found your website by means of Google while looking for a related matter, your web site came up. It seems good. I have bookmarked it in my google bookmarks to come back then. Hiya, I’m really glad I have found this info. Nowadays bloggers publish just about gossip and internet stuff and this is actually frustrating. A good site with interesting content, that is what I need. Thanks for making this web site, and I’ll be visiting again. Do you do newsletters by email? Hey there. I discovered your website by way of Google whilst searching for a similar subject, your site got here up. It seems good. I have bookmarked it in my google bookmarks to come back then. Hello there. I discovered your web site by the use of Google whilst searching for a related matter, your site came up. It appears to be great. I have bookmarked it in my google bookmarks to come back then. Great amazing issues here. I am very satisfied to peer your post. Thanks a lot and i’m looking ahead to touch you. Will you please drop me a mail? Hey there. I found your website by means of Google at the same time as searching for a comparable matter, your web site came up. It seems to be good. I’ve bookmarked it in my google bookmarks to come back then. Hello there. I found your site by the use of Google at the same time as looking for a similar topic, your website came up. It seems to be great. I have bookmarked it in my google bookmarks to visit then. Hey there. I discovered your site by the use of Google at the same time as searching for a comparable topic, your web site got here up. It seems great. I’ve bookmarked it in my google bookmarks to visit then. Hey there. I found your site by the use of Google even as looking for a similar topic, your website got here up. It appears good. I have bookmarked it in my google bookmarks to come back then. Hey there. I found your web site by the use of Google even as looking for a similar topic, your site came up. It seems to be good. I’ve bookmarked it in my google bookmarks to come back then. Hiya, I am really glad I have found this info. Nowadays bloggers publish only about gossip and web stuff and this is really frustrating. A good blog with interesting content, that is what I need. Thanks for making this site, and I’ll be visiting again. Do you do newsletters by email? Hi there. I discovered your web site via Google whilst looking for a comparable topic, your website got here up. It appears good. I have bookmarked it in my google bookmarks to visit then. Hiya, I am really glad I have found this information. Nowadays bloggers publish just about gossip and web stuff and this is really irritating. A good site with exciting content, that’s what I need. Thanks for making this web-site, and I’ll be visiting again. Do you do newsletters by email? Hiya, I am really glad I’ve found this information. Nowadays bloggers publish only about gossip and internet stuff and this is really annoying. A good blog with exciting content, this is what I need. Thanks for making this website, and I will be visiting again. Do you do newsletters by email? Hello there. I found your blog by the use of Google at the same time as searching for a related subject, your website came up. It looks great. I have bookmarked it in my google bookmarks to visit then. Hiya, I’m really glad I’ve found this information. Today bloggers publish only about gossip and internet stuff and this is really irritating. A good blog with exciting content, that is what I need. Thanks for making this web site, and I will be visiting again. Do you do newsletters by email? Hiya, I am really glad I have found this info. Nowadays bloggers publish only about gossip and internet stuff and this is actually irritating. A good web site with interesting content, this is what I need. Thanks for making this web site, and I’ll be visiting again. Do you do newsletters by email? Hi there. I discovered your blog via Google at the same time as looking for a related matter, your site got here up. It appears great. I’ve bookmarked it in my google bookmarks to visit then. Hiya, I’m really glad I have found this information. Today bloggers publish just about gossip and web stuff and this is really frustrating. A good site with exciting content, that is what I need. Thank you for making this web-site, and I’ll be visiting again. Do you do newsletters by email? Hiya, I am really glad I have found this info. Nowadays bloggers publish just about gossip and web stuff and this is really irritating. A good web site with interesting content, that’s what I need. Thank you for making this web-site, and I’ll be visiting again. Do you do newsletters by email? Hello there. I found your web site by means of Google whilst searching for a related matter, your site got here up. It looks good. I have bookmarked it in my google bookmarks to visit then. Hiya, I am really glad I’ve found this information. Today bloggers publish just about gossip and net stuff and this is really frustrating. A good blog with interesting content, that’s what I need. Thank you for making this site, and I will be visiting again. Do you do newsletters by email? Hi there. I found your website by means of Google even as looking for a comparable subject, your website got here up. It seems to be good. I’ve bookmarked it in my google bookmarks to visit then. Hiya, I’m really glad I have found this information. Today bloggers publish only about gossip and web stuff and this is actually frustrating. A good web site with exciting content, this is what I need. Thank you for making this web site, and I’ll be visiting again. Do you do newsletters by email?